The Day of the Dead is a Latin American tradition honoring and celebrating the life of loved ones who have died. On November 1 and 2, cemeteries come alive with family gatherings, a big meal, prayers, and children laughing and playing, The gravestones are cleaned and decorated with flowers and in the evening candles light the way for all. Those who celebrate the Day of the Dead believe that the spirit of their dead loved one returns to visit them on November 1 and November 2. 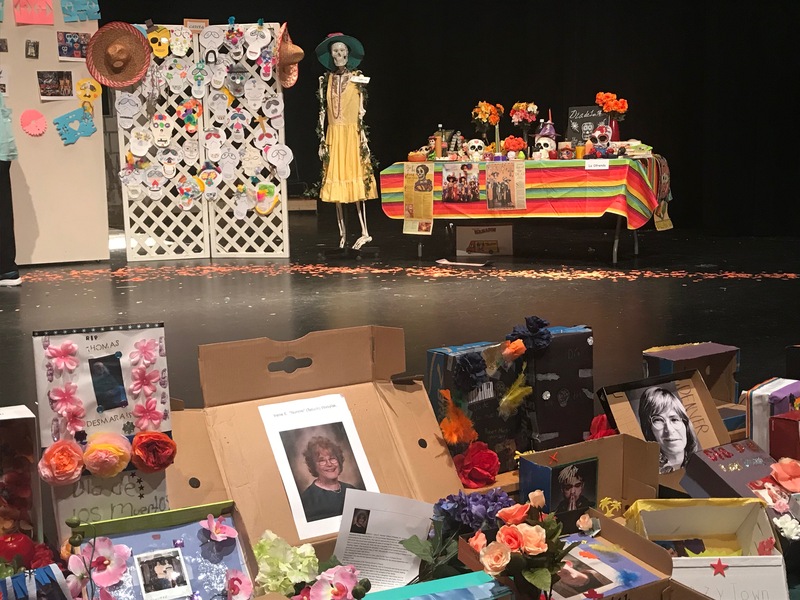 At home, families construct an ofrenda (offering) to honor their dead loved ones. Ofrendas usually have a picture of the person being remembered, flowers, fruits, candles, incense, and most importantly something the loved one enjoyed in life. Students in grades 7 & 8 Spanish classes prepared for and experienced The Day of the Dead on Friday. Check out the pictures. Thank you to Senora McLeod and Senor Robinson for organizing this extraordinary event!